Apple is serious this time to enhance its iPhone security that even it can not hack. To achieve this the company has hired one of the key developers of Signal — World's most secure, open source and encrypted messaging app. Frederic Jacobs, who worked to develop Signal, announced today that he is joining Apple this summer to work as an intern in its CoreOS security team. 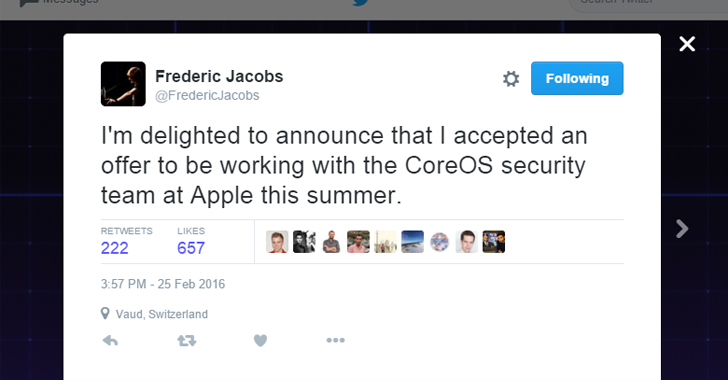 "I'm delighted to announce that I accepted an offer to be working with the CoreOS security team at Apple this summer," Jacobs tweeted Thursday. Signal app is widely popular among the high-profile privacy advocates, security researchers, journalists and whistleblowers for its clean and open source code, and even the NSA whistleblower Edward Snowden uses it every day. Signal messages are end-to-end encrypted, which means only the sender and the intended recipient can read the messages. Although Apple's iMessage is also end-to-end encrypted, it is not open source. The reason behind the Apple's hiring is quite clear as the company is currently fighting a US court order asking Apple to help the FBI unlock iPhone 5C of San Bernardino shooter Syed Farook. Basically, Apple is deliberately forced to create the special, backdoored version of iOS, so that the Federal Bureau of Investigation (FBI) may be able to Brute Force the passcode on Farook's iPhone without losing the data stored in it. However, Apple CEO Tim Cook has already refused to provide such a backdoor into the iPhone that would degrade the privacy and security of all iPhone users. If comply with the court order, the company would be flooded by the FBI and the CIA requests to unlock more iPhones of criminals in near future and the recent request made by the United States government to unlock 12 more iPhones would be just a starter. But, in an effort to eliminate the chance for government and intelligence agencies for demanding backdoors, the company is removing its own ability to do that, for which they are hiring new interns in its core security team. Apple found Jacobs a good fit for this, as he had spent two and half years with Open Whisper Systems, the company behind Signal, before leaving the company earlier this year. Apple is working on encrypting iCloud backups that only the account owner would have access, eliminating either way for the government or hackers that could expose its users data. While creating iCloud backups of users' photos, videos, app data, iMessage, voicemails, SMS, and MMS messages, Apple stores a copy of its users' decryption keys itself that could be provided to authorities when presented with a valid warrant. But citing some anonymous sources, the Financial Times reports that now Apple will not keep a copy of user's decryption key with it, and the encrypted iCloud backups would only be unlocked by the account holder using her/his passcode.